Made a pizza last night. Since we've got some Franklin Barbecue chopped-beef, decided to throw some on the pizza. Turned out well. Pictures from Saturday's 2nd Annual Gettin' Sauced! Deets: 185 BBQ sauces from 26 states, Canada, & England, to be judged by a private judges' panel. 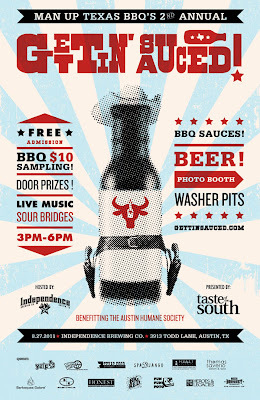 44 sauces (the People's Choice Award contenders) & BBQ available for tasting to holders of a BBQ-sampling wristband. Wristbands are $10 at gate but just $8 online. 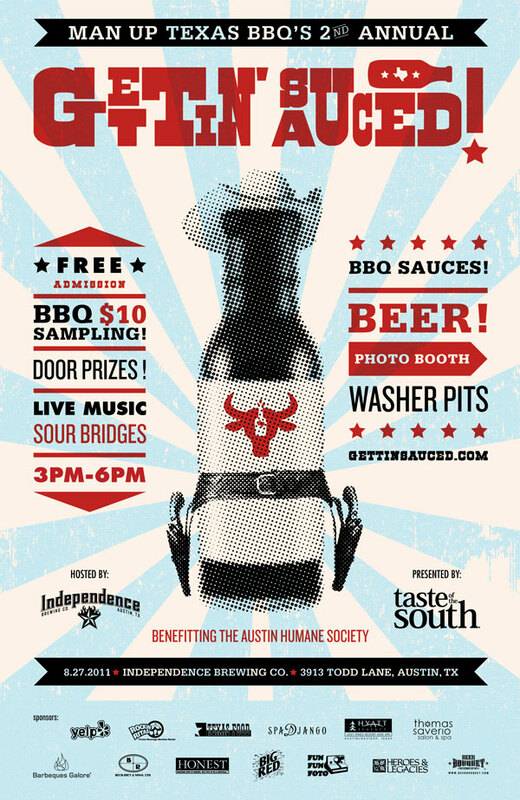 Admission to the event is FREE and covers everything the festival offers other than the BBQ wristbands: live music from two Austin bands, drinks from Independence Brewing Co., Big Red, & Honest Tea. Washers, photo booth, massages. Loads of door prizes up for grabs. Official Gettin' Sauced merchandise for sale (shirts, koozies, & posters). Phil's Texas BBQ in Houston closed its doors April 26. Very best wishes to all of the Phil's family. Here are 3 of the 8 short videos I made when I got to tag along to Luling and Lockhart with some BBQ heavyweights. In order from top to bottom: the holding pits at Kreuz Market (Lockhart), the ordering area at Smitty's Market (Lockhart), & sitting down at City Market (Luling). See all videos on Man Up Texas BBQ's YouTube channel. Loads of pictures to come. Don't know when it happened, but Bar D BBQ in Boerne has shut down. Very best wishes to Perry and all of the Bar D family.